Your smile can become discoloured by drinking certain beverages, eating staining foods, aging, smoking and even medications can lead to teeth that look yellowish or gray. You can easily reclaim a bright smile with teeth whitening available at Dentist WA Canning Vale. We offer two methods to professionally whiten your teeth: in-chair power whitening and take-home whitening that is professionally guided. With in-chair whitening, you’ll have a single visit that takes about an hour and leave with teeth that have been whitened up to eight shades lighter. The Zoom! whitening system is a professional-grade, extremely safe and highly effective way to easily whiten your teeth several shades whiter. Trials have shown that it’s up to 40% more effective than other teeth whitening treatments! The whitening treatment results can last up to two years – but the treatment itself only takes about 90 minutes so you could even do it in a longer lunch break with our handy Canning Vale location! Ask us about the Philips $50 cash back offer on Zoom! in-chair whitening treatments. The promotion runs from October 1 to 28 February 2019. 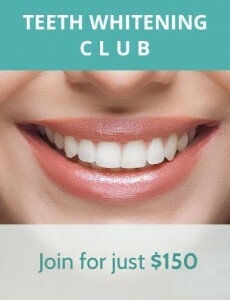 After your teeth whitening appointment we will provide you a coupon to present to Phillips to receive your $50 cashback. This brings our whitening deal (after the Phillips cashback) down to $549. Just in time for summer! Read the full details of the offer or call us today for more information. At Dentist WA Canning Vale we will always ensure you are a good candidate and follow our professional guidelines. You must have attended a recent preventative care appointment with the last month and be over 18 years of age. Do you prefer to whiten on your own time? Are you looking for a convenient way to extend your results? If your busy life makes it tough to visit our practice, we also offer whitening kits that you can take home with you. You’ll receive our guidance and instructions to maximise your results. After making an impression of your teeth, we will create a set of customised trays that you wear for just 90 minutes a day. In two weeks, you’ll enjoy significantly brighter teeth. You can touch up at any time! Contact us today to learn more about our teeth whitening in Canning Vale or to book your appointment!